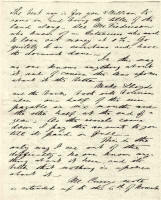 Stored in the old safe at "La California" is a collection of letters from the years 1878 to 1882 relating to Frank’s failed business ventures and his likely drowning, as well as other documents relating to legal issues as a consequence of his death. 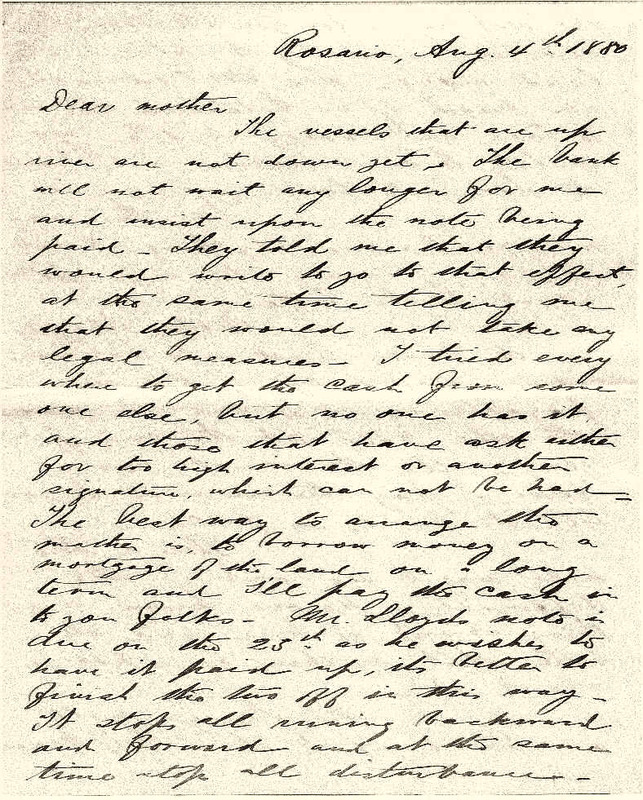 Frank's first letters are highly optimistic; the later ones are defensive and desperate as his investments run into trouble. There is a plea to the governor to extend the contract period for Colonia Espín, letters from creditors (one is none too flattering about his integrity), and two from Johnnie to Willie in which he describes his search for Frank’s body and how Frank most likely drowned crossing the Saladillo river. 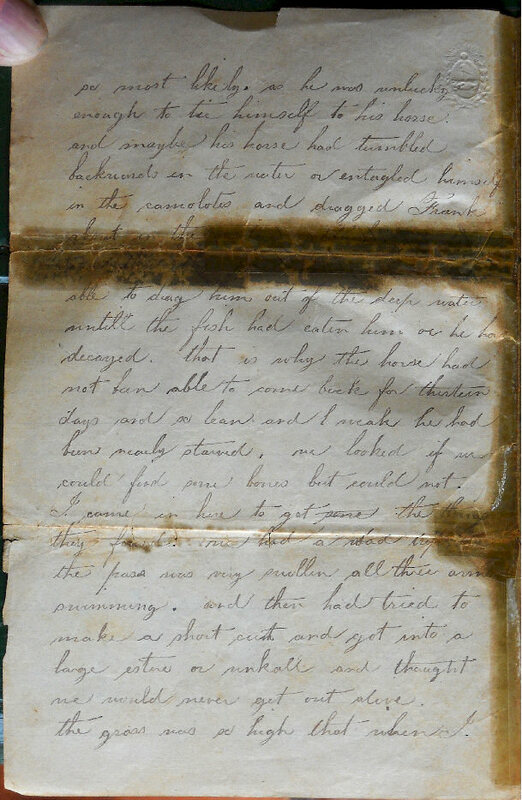 We have transcribed the letters as written, neither changing nor correcting any errors in spelling or punctuation. However, for clarity, we added page number separators to the text. Anything else that we added is enclosed in [square brackets]. When time allows, we will add English translations to the letters written in Spanish. We are especially grateful to Charles A. Benitz for kindly allowing us to make copies of all of these documents — enthusiastically assisted by his daughter, Veronica. And to Javier Maffucci-Moore for providing us with background information via excerpts from newspaper articles and letters. We explain here some of the measures used in the letters. However, for a more detailed explanation, please refer to our Measures page. Per the US Treasury in 1879, one Bolivian Dollar (gold & silver) was worth U$D 0.965, and in 1881 one $B (peso boliviano, silver only) equaled 0.823 U$D. Frank used both terms, but mostly $B. Adjusting solely for inflation to U$D in 2000, one $B is worth today U$D 18.98 (almost 19.00). However, when adjusted for earnings its value is between three and seven times that, between U$D 60 - 130. Per the US Treasury in 1882, one Argentine peso duro was worth one U$D. Adjusted solely for inflation to U$D in 2000, it is worth approx. U$D 24, but when adjusted for earnings it is in the range of U$D 70 - 160. An arroba is a measure of weight: 11.58 kg. (25 lb.). 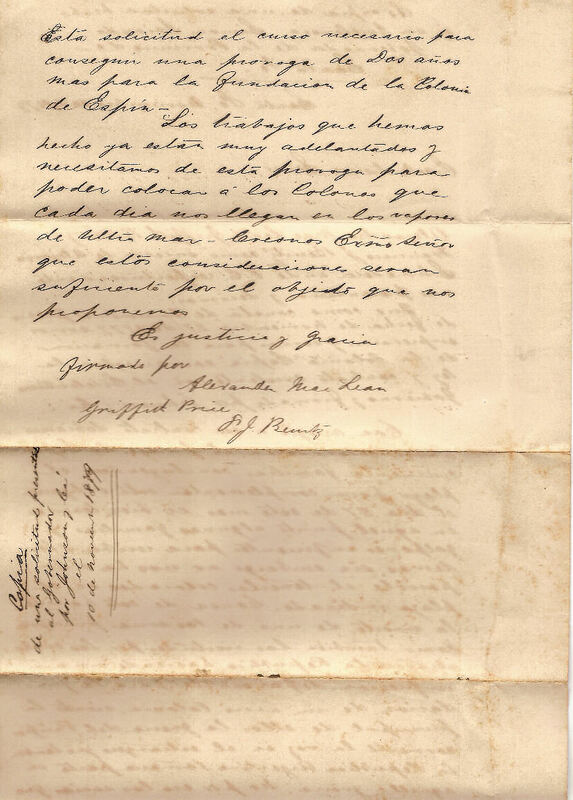 July 27, 1878 San Javier, SFé FJ Benitz Diary Assumed Schmeaderer's share of Colonia Espín (including debts). Sep.24, 1879 Rosario, SFé FJ Benitz Brother Rented Dr Romang's monte to cut wood, with optimistic plans for its exploitation. 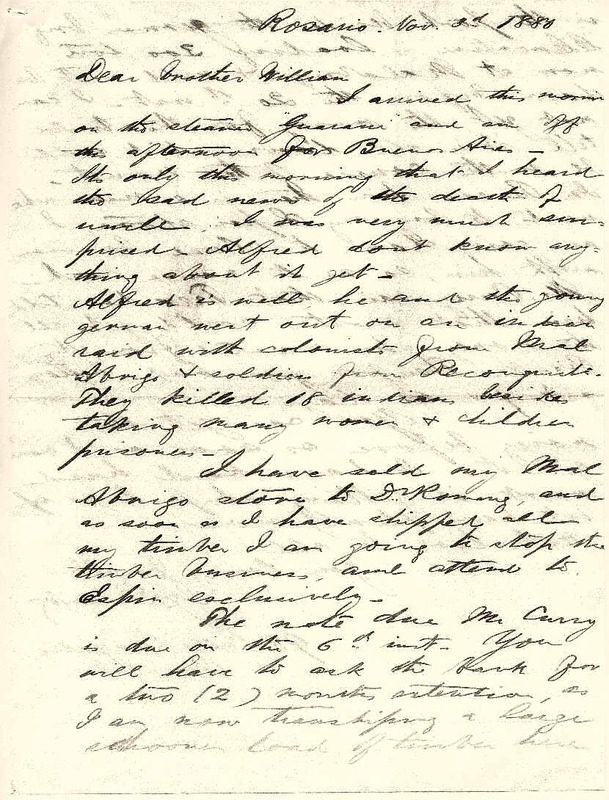 Oct. 4, 1879 B.A. newspaper The Standard Frank is mentioned in an optimistic article about the agricultural prospects of north Santa Fé. 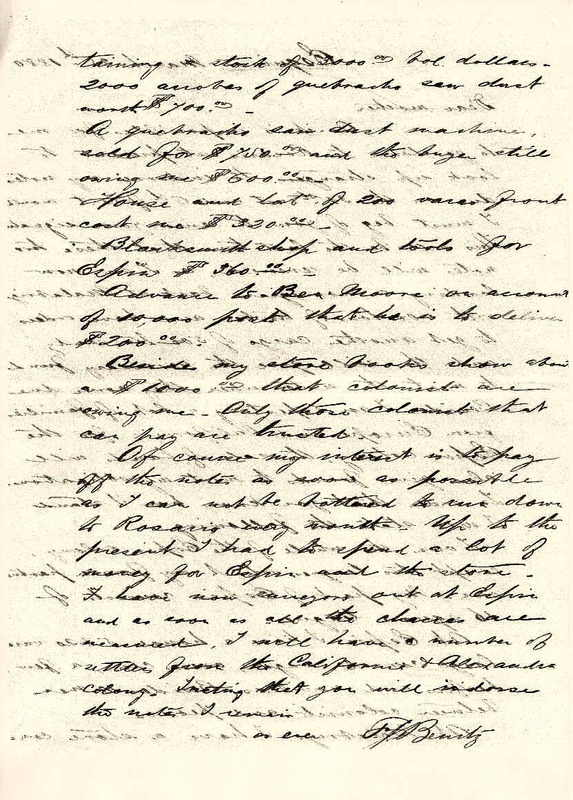 Nov. 7, 1879 B.A. newspaper The Standard Frank is mentioned in a glowing article about the timber industry in Santa Fé. Gobernador Solicitud / request to extend by two years the contracted period within which to develop Colonia Espín. 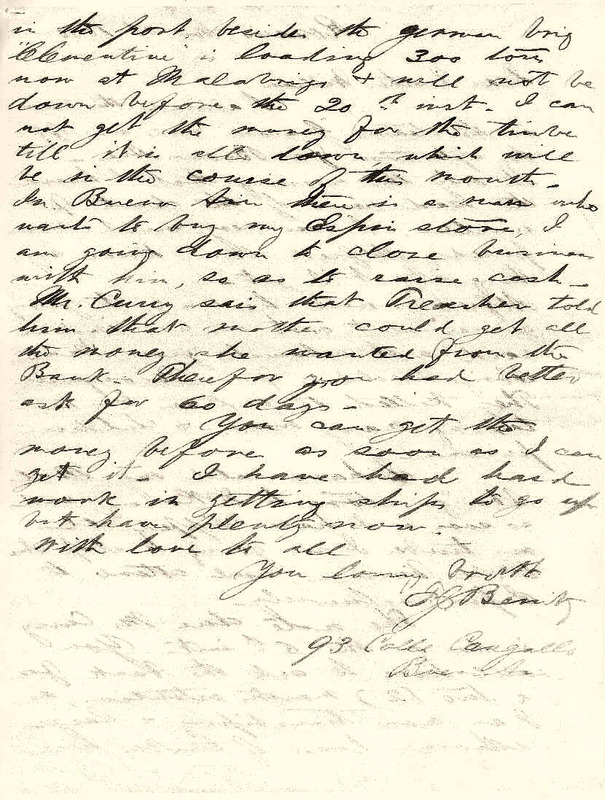 Feb.15, 1880 Rosario, SFé FJ Benitz His mother Everything going well: bought out Espín partners, bought Romang's store; requests she endorse note to Mr. Curry. 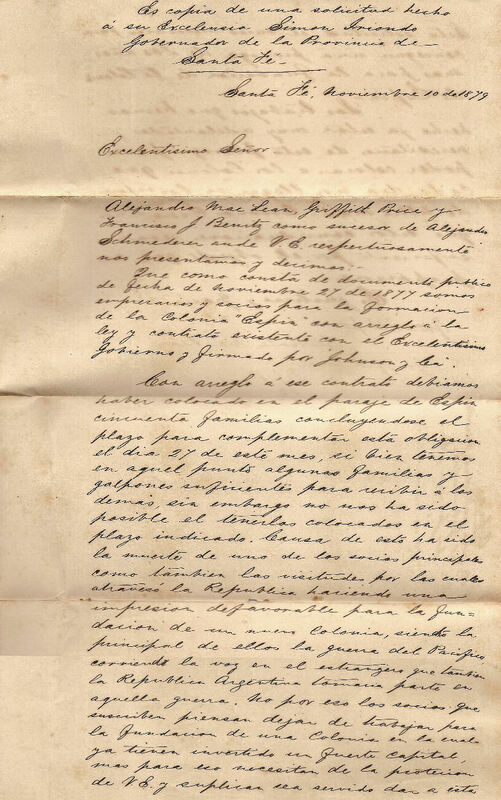 Mar.25, 1880 Esquina, SFé FJ Benitz His mother He can not travel to Rosario, requests she renew her signature on his notes: lists the notes (not valued) and his assets (valued), apparently in reply to doubts about his financial status. 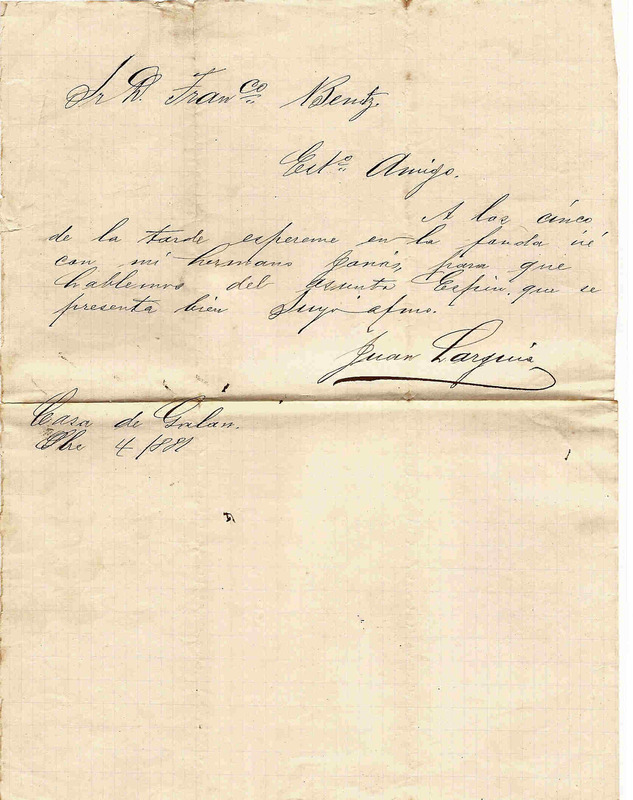 May 19, 1880 Rosario, SFé J. Lloyd Mrs. Benitz Politely but firmly requests payment of a "pagaré" due May 16. 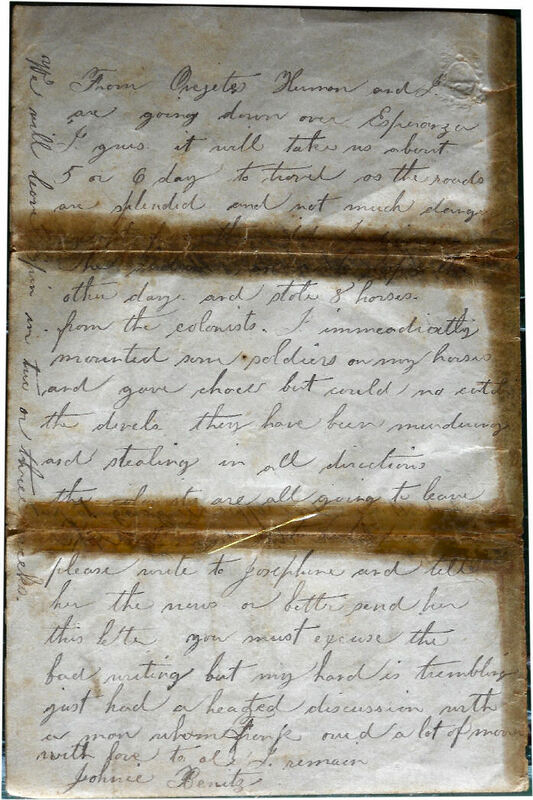 Aug.4, 1880 Rosario, SFé FJ Benitz His mother Bank loans due, Lloyd's note due, Curry's soon to be. Goods delayed, fresh loans not available, requests she mortgage the estancia. 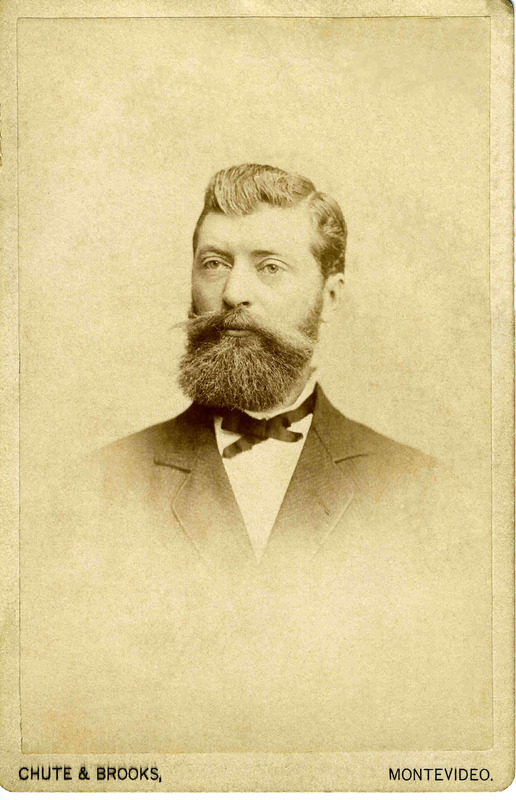 Nov.3, 1880 Rosario, SFé FJ Benitz Bro. William Sold store back to Romang, ending timber business, dedicating self to Espín. Note to Mr Curry due, payment for timber delayed, request mother obtain bank loans. 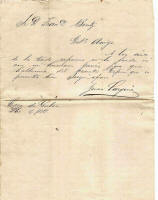 Oct.4, 1881 Buenos Aires Juan Larguia Fco. Benitz Arranging a meeting regarding Espín. 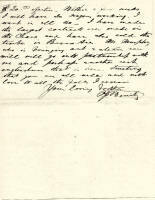 Nov.1, 1881 Buenos Aires Herm Altgelt FJ Benitz Furious letter listing debts owed, fraud, lies, broken promises, misuse of funds, taking legal action. 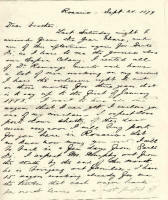 Dec.9, 1881 Colonia Espín Johnnie Bz William Bz Sad news, Frank's likely drowning, sending Eliza and sister to La California, Colonia Espín taken over by the provincial government. 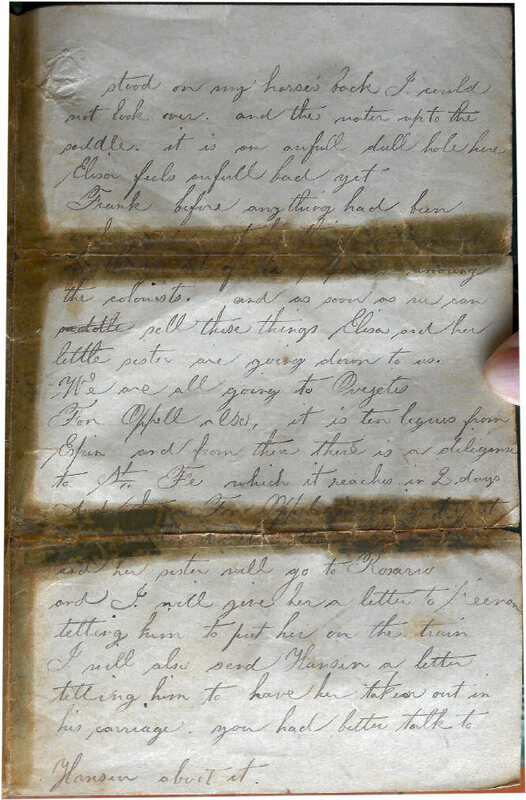 Jan.5, 1882 Colonia Alejandra Johnnie Bz William Bz The search for signs of Frank, how he may have drowned; Eliza, Johnnie & Herman's schedule. 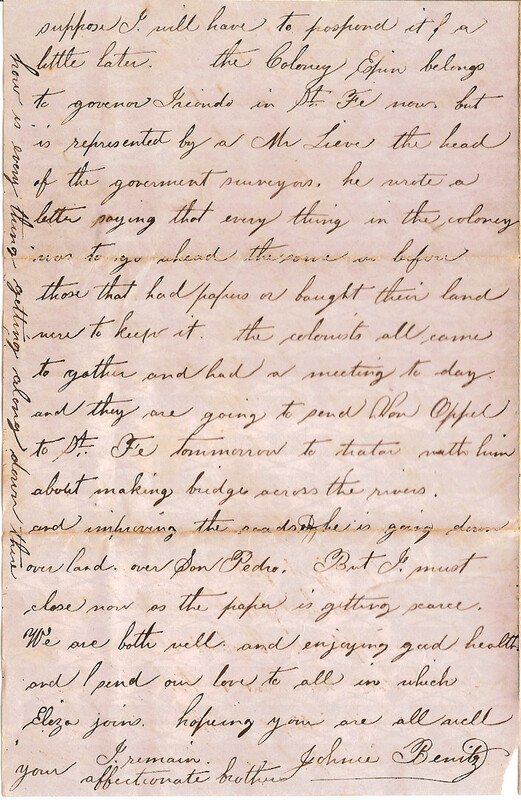 Feb.14, 1882 Santa Fé (city) Alexander McLean Governor Petition seeking relief from debt left by Frank Benitz. 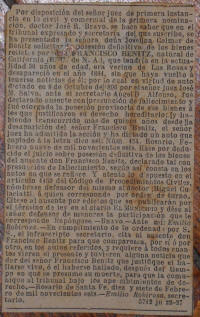 Feb.17, 1906 Rosario, SFé newspaper El Municipio Legal notice, published at court order, finalizing Frank's affairs. May 21, 1908 Rosario, SFé F.C. Marty Bz brothers Legal fees to declare Frank dead and release his property (if any) to Josephine K. Bz. 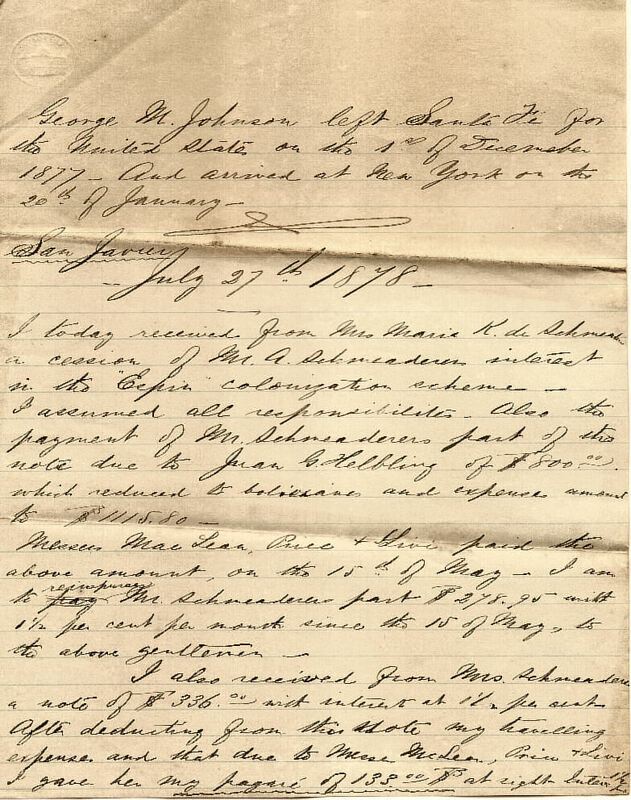 George M. Johnson left Santa Fé for the United States on the 1st of December 1877. And arrived at New York on the 20th of January. I today received from Mrs Maria K. de Schmeaderer a cession of Mr. A. Schmeaderers interest in the "Espin" colonization scheme. I assumed all responsibilities. 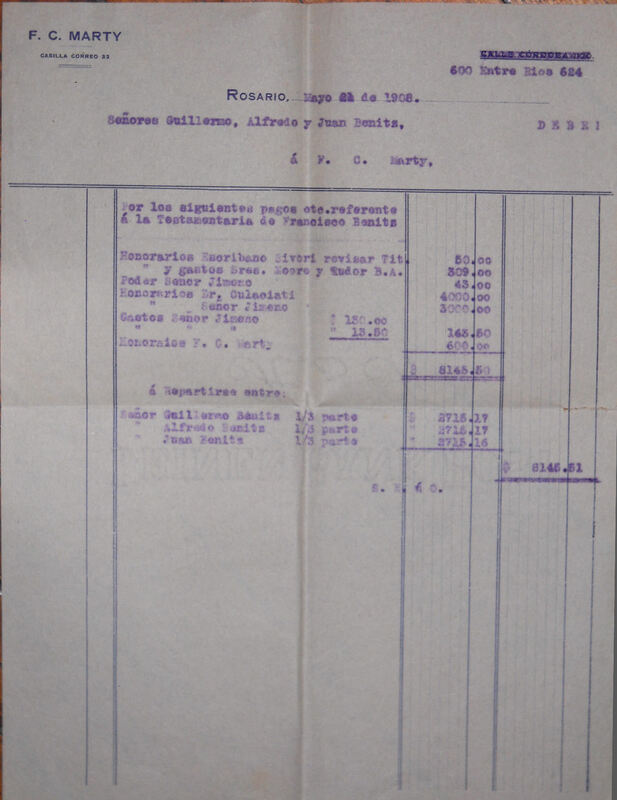 Also the payment of Mr. Schmeaderers part of the note due to Juan G. Helbling of $800.00. which reduced to bolivianos and expenses amount to $B1115.80. 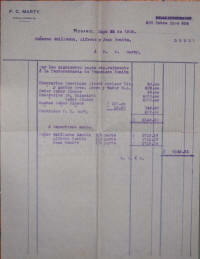 Messrs MacLean, Price & Livi paid the above amount, on the 15th of May. I am to pay reimburse Mr. Schmeaderers part $B278.95 with 1½ per cent per month since the 15 of May, to the above gentlemen. 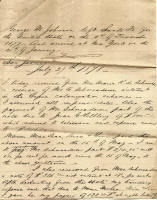 I also received from Mrs. Schmeaderer a note of $336.00 with interest at 1½ per cent. After deducting from this note my travelling expenses and that due to Messrs McLean, Price & Livi I gave her my pagaré of 133.00$B at sight. 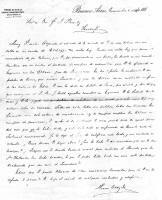 Interest 1½ per c.
Que como consta de documento publico de fecha de noviembre 27 de 1877 somos empresarios y socios para la formacion de la Colonia "Espin" con arreglo á la ley y contrato existente con el Excelentisimo Gobierno y firmado por "Johnson & Cia". Con arreglo á ese contrato debiamos haber colocado en el paraje de Espin cincuenta familias concluyendose el plazo para complementar esta obligacion el dia 27 de este mes, si bien tenemos en aquel punto algunas familias y galpones suficientes para recibir á los demas, sin embargo no nos ha sido posible el tenerlos colocados en el plazo indicado. Causa de esto ha sido la muerte de uno de los socios principales como tambien las visitudes por las cuales atravesó la Republica haciendo una inpresion defavorable para la fundacion de un nuevo Colonia, siendo la principal de ellos la guerra del Pacifico, corriendo la voz en el estrangero que tambien la Republica Argentina tomaria parte en aquella guerra. No por eso los socios que suscriben piensan dejar de trabajar para la fundacion de una Colonia en la cual ya tienen invertido un fuerte capital, mas para eso necesitan de la proteccion de V. E. y suplican sea servido dar a esta solicitud el curso necesario para conseguir una proroga de Dos años mas para la fundacion de la Colonia de Espin. I am down from the Gran Chaco for a few days, today I am off for Buenos Aires and will be back again on Friday or Saturday next. Everything is going on well in the Chaco. I have bought out my partners in the "Espin" Colony I have all to myself now 16 square leagues of land, and am building now a house on it, the corral is finished. I have emigrants on the land also peones. I have also bought out Dr. Romangs store and rented half of his big house. A cook by the name of Waldi that used to cook for Scharff is my cook up there. The store is a splendid business, it is the largest in the Colony. I have got some 2500$B stock in it, and am buying a great deal more here. The store in the first month that I had it, left me nearly $B500.00 profit. Mr. Currys note is due and he has extended the time for me, as it suits him better to do so and at the same time I require the money to buy a fresh stock for the store. Please endorse the note and send it in to him as soon as possible. I got news this morning that the soldiers have captured cacique "Mariano" and all the Indians of San Martin. They are on their way now to Martin Garcia. Uncle knows the chief. This is great news for Espin. I own the whole of the Espin colony, except two leagues which my former partners own. My part of Espin consists of 16 square leagues. At Espin I have a house 5 x 20 varas, large corral, wagon, oxen, cows, a few heifers and novillos. Besides l0 men between colonists and peones. At Malabrigo I have a store containing a stock of 3000.00 bol. dollars, 2000 arrobas of quebracho saw dust worth $B700.00. A quebracho saw-dust machine sold for $B750.00 and the buyer still owing me $B600.00. House and lot of 200 varas front cost me $B320.00. Blacksmith shop and tools for Espin $B360.00. Advance to Ben Moore on account of 10,000 posts that he is to deliver $B200.00. Besides my store books show about a $B1000.00 that colonists are owing me. Only those colonists that can pay are trusted. as ever F. J. Benitz. 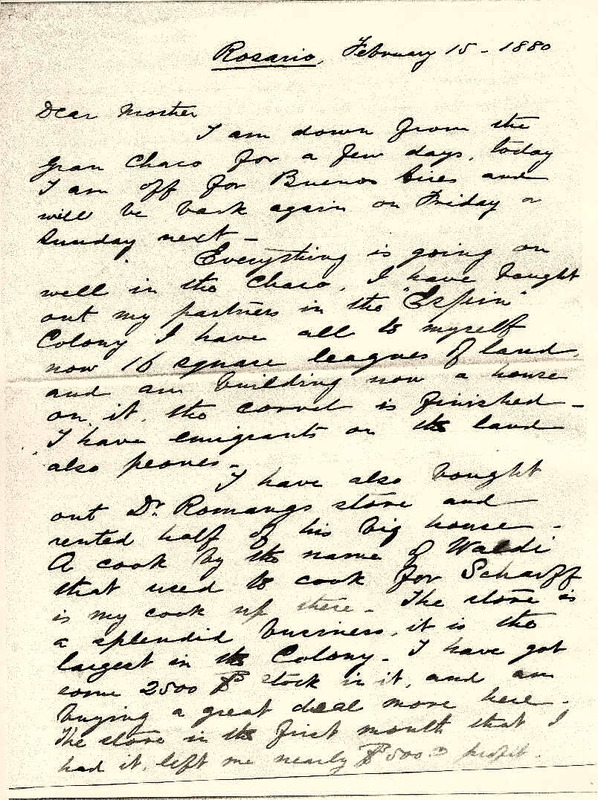 I have written several letters to your son Mr F. J. Benitz, without receiving any letter from him. My last letter was simply advising him that the "Pagaré" which I have against your good self & Him, falls due on the 26th inst. and I shall be oblidged if you will be good enough to meet it the day it becomes due. The amount is $B4l23.60 Bolivianos Efectivos. You will, I am sure, understand the reason why, I write to you. As I should not like to file a protest if not paid on that date. The vessels that are up river are not down yet. The bank will not wait any longer for me and insist upon the note being paid. They told me that they would write to you to that effect, at the same time telling me that they would not take any legal measures. I tried everywhere to get the cash from some one else, but no one has it and those that have ask either for too high interest or another signature, which cannot be had. The best way to arrange the matter is, to borrow money on a mortgage of the land on a long term and I'll pay the cash in to you folks. 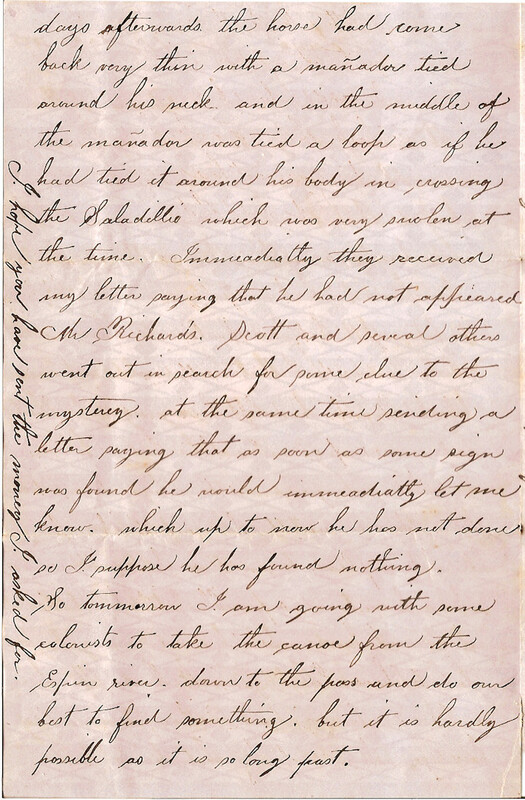 Mr. Lloyds note is due on the 25th as he wishes to have it paid up, its better to finish the two off in this way. It stops all running backward and forward and at the same this stops all disturbance. The best way is for you & William to come in and bring the titles of the land along. See Mr. Fredericson who knows of an Estanciero who wants to loan out money at 1%. Go quitely to an escribano and have the documents done. In this way no one knows anything about it, and of course the less spoken about it the better. Make Lloyds and the banks both into bolivians silver one half of the sum payable in six months and the other half at the end of a year. As the vessels come down I pay the amount to you till its paid in full. This is the only way I see out of the difficulty. No one knows anything about it here, and its better that nothing is spoken about it. Mr. Currys note is extended up to the 6th of November, he wishes me to have it renewed. I have four schooners up river loading and as the Cisne is one of the first steamers going up, I leave on it this evening in order to hurry up the loading and get the other cargos ready. Realy the only way to get money here is on a mortgage, I have tried every capitalist and bank in town. I arrived this morning on the steamer "Guaraní" and am off this afternoon for Buenos Aires. Its only this morning that I heard the sad news of the death of uncle. I was very much surprised. Alfred dont know anything about it yet. Alfred is well, he and the young german went out on an indian raid with colonists from Mal Abrigo & soldiers from Reconquista. They killed 18 indians besides taking many women and children prisoners. I have sold my Mal Abrigo store to Dr Romang, and as soon as I have shipped all my timber I am going to stop the timber business, and attend to Espin exclusively. The note due Mr Curry is due on the 6th inst. You will have to ask the bank for a two (2) months extension, as I am now transhiping a large schooner load of timber here in the port, besides the german brig "Clementine" is loading 300 tons now at Malabrigo & will not be down before the 20th inst. I cannot get the money for the timber till it is all down, which will be in the course of this month. In Buenos Aires there is a man who wants to buy my Espin store, I am going down to close business with him, so as to raise cash. Mr. Curry sais that Treacher told him that mother could get all the money she wanted from the Bank. Therefor you had better ask for 60 days. You can get the money before as soon as I can get it. I have had hard work in getting ships to go up but have plenty now. A las cinco de la tarde espereme en la fanda [fonda], iré con mi hermano Janás [Jonás], para que hablemos del asunto Espin, que se presenta bien Suyo afmo. Expect me at five in the afternoon at the inn, I will come with my brother Jonás, to discuss the Espin matter, which looks good. Yours sincerely. Buenos Aires, Noviembre 1, 1881. Muy Sr. mio. Adjunto el estracto de la cuenta de U. en mis libros con un saldo en su contra de $2l6.297— m/c valor hoy. Contra este saldo hay que poner el inventario de su Colonia, que U, por documento en mi poder, ha puesto en mi nombre, tambien va en contra el producto de compras de .....ias [?] que U. ha efectuado en Esquina con los $l5000- giro de Demascani. En las 2 fechas ha empeñado U. su palabra de honor, que existia Inventario y que los $15000.- serian empleados en favor de los colonos de Espin. U. me ha dado su palabra de honor, por escrito y por telegrama, que entregaria al Sr. Don J. Wild aquellas compras en Esquina. U ha fallado las 2 veces, y U. ha jugado con su palabra de caballero de un modo que echa una luz muy estraña sobre su caracter. Toda su vida, todas sus palabras, todas sus promesas han formado una sola cadena de mentiras; en vez de compras emplear los $15000 en compras de provisiones, U. se ha ha sustraido la mas grande parte de aquel dinero del uso que yo le habia dado; y este solo acto es suficiente de llevarlo ante el Tribunal correccional. Yo le dije al Juez de calificar este hecho, y me contento en citarlo. ¿Como piensa U. pagar ahora? ¿Que ha hecho U. del inventario que no le pertenecia? ¿Porque no ha tenido bastante moral para impedir el Remate que los Srs Challandes han hecho decretar, lo que U. podia haber hecho con una sola palabra declarando que era mio el Inventario? Espero que U. puede liberarse de estas acusaciones tremendas, que, si U. no las refuta le ponen a U. bajo el nivel de cualquier embustero y estafador. Colonia Espin. 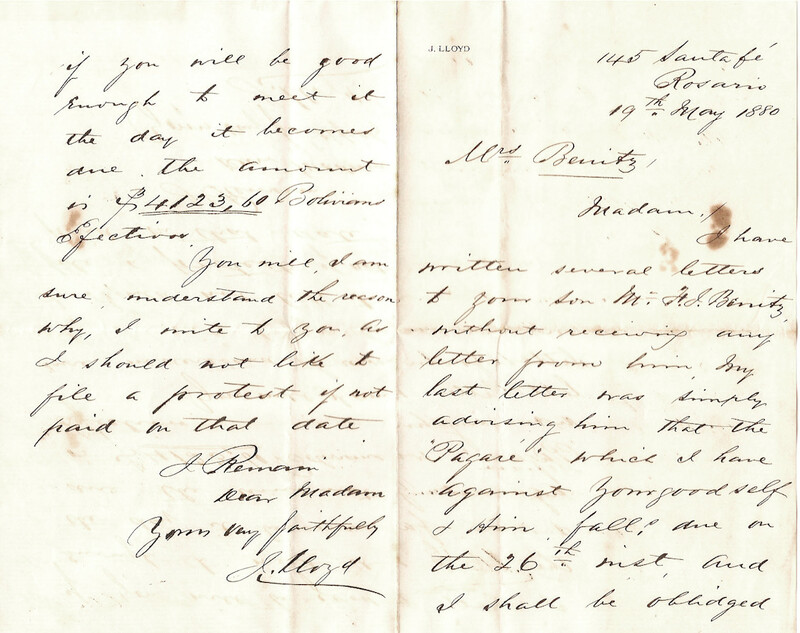 Dec. 9th 1881.
it is my duty to write you some very bad news. 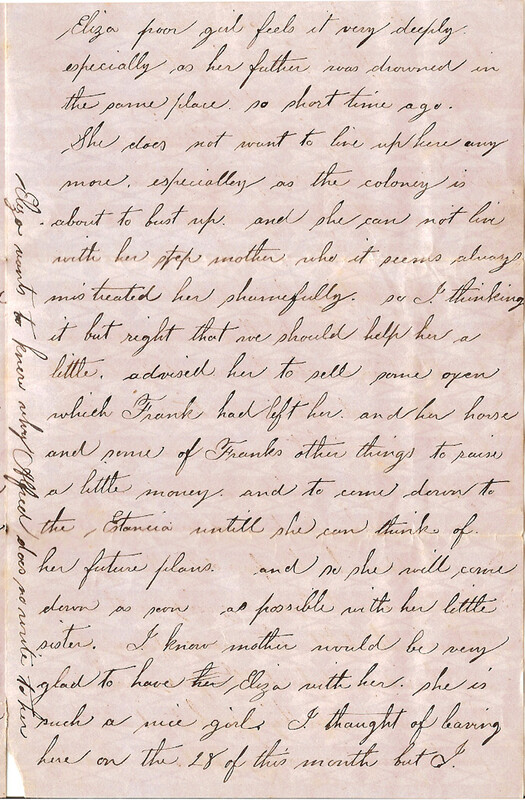 I wrote to you before that Frank was down in St. Fe for nearly two months settling about the land. 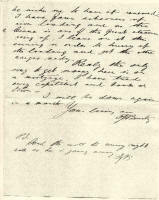 He wrote me a letter saying that he had failed to become the whole land, but that he would not come home empty handed saying also that he was coming out on the 23rd but as he did not come, and Eliza was nearly in despair waiting so long for him. 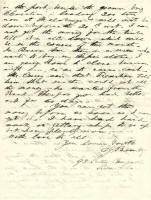 I wrote a letter to Scott in Alexandria asking him to let me no what he had heard of Frank and when he was coming back. He wrote back that Frank had left there on the 23 to come out here [approx. 30 km. from Alejandra to Colonia Espín—a 1/2 day ride] on a good fat horse he had hired and that ten or twelve days afterwards the horse had come back very thin with a mañador [a single long rawhide strap with a ring, similar to a laso] tied around his neck and in the middle of the mañador was tied a loop as if he tied it around his body in crossing the Saladillo [El Toba / Saladillo Dulce] which was very swolen at the time. Immediately they received my letter saying that he had not appeared. 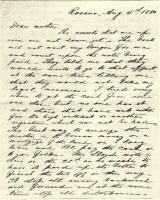 Mr. Richards, Scott and several others went out in search for some clue to the mystery, at the same time sending a letter saying that as soon as some sign was found he would immediately let me know, which up to now he has not done so I suppose he has found nothing. So tomorrow I am going with some colonists to take the canoe from the Espin river down to the pass and do our best to find something, but it is hardly possible as it is so long past. Eliza poor girl feels it very deeply, especially as her father was drowned in the same place so short time ago. She does not want to live up here any more, epecially as the colony is about to bust up, and she cannot live with her stepmother who it seems always mistreated her shamefully. So I, thinking it but right that we should help her a little, advised her to sell some oxen which Frank had left her, and her horse and some of Frank’s other things to raise a little money, and to come down to the Estancia untill she can think of her future plans. And so she will come down as soon as possible with her little sister. I know mother would be very glad to have her Eliza with her, she is such a nice girl. I thought of leaving here on the 28 of this month but I suppose I will have to postpone it a little later. The Colony Espin belongs to governor Iriondo in St. Fe now but is represented by a Mr. Lieve the head of the government surveyors. 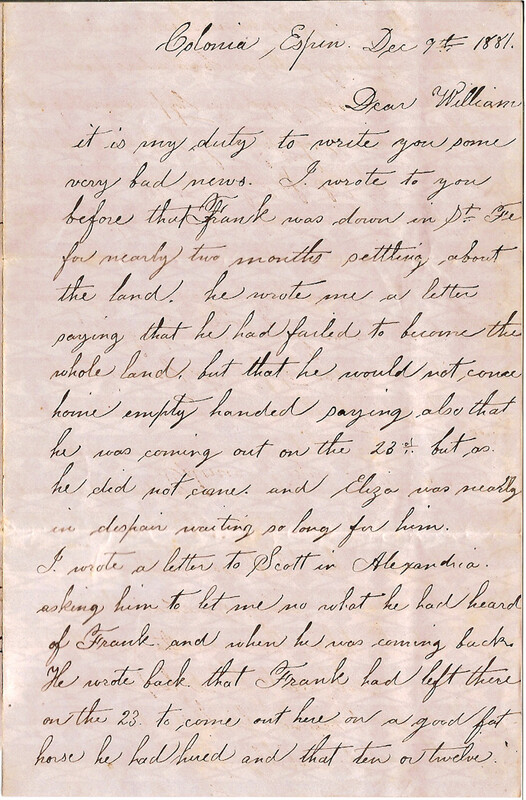 He wrote a letter saying that everything in the colony was to go ahead the same as before, those that had papers or had bought their land were to keep it. The colonists all came together and had a meeting today, and they are going to send Don Oppel to St. Fe tomorrow to tratar [arrange] with him about making bridges across the rivers and improving the roads. He is going down overland over San Pedro. But I must close now as the paper is getting scarce. [Page 2] I hope you have sent the money I asked for. 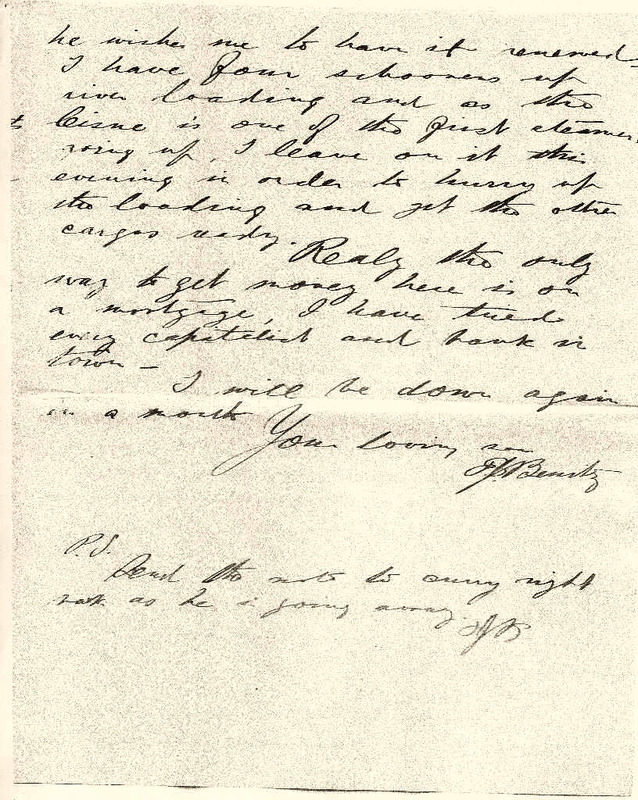 [Page 3] Eliza wants to know why Alfred does no write to her. I now sit down to answer your letter I. received yesterday with the money in it all right. 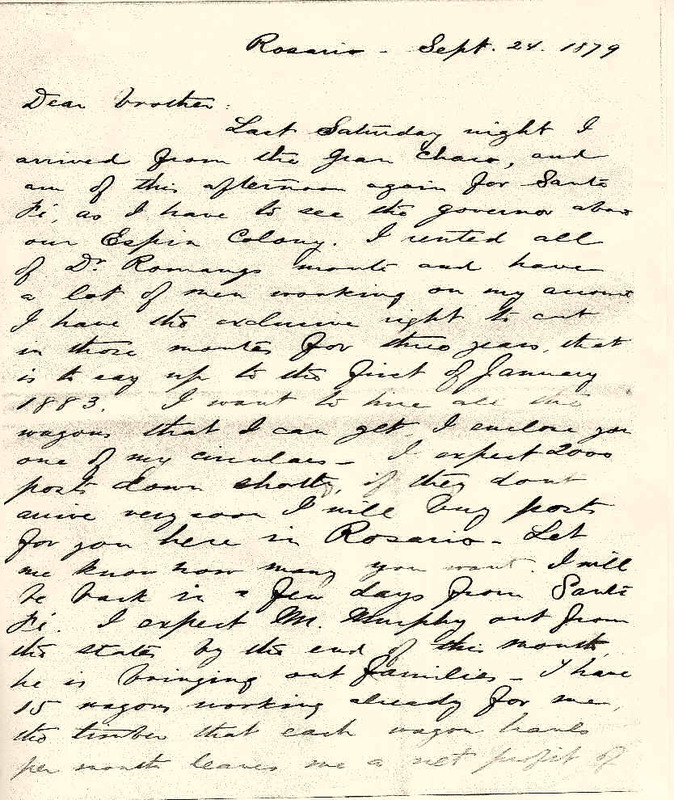 I. also received a letter from Josephine and one from Clara and was very glad to hear from home and that you were all well. we are also all enjoying good health. I suppose you received my letter about Franks death. I. wrote to you that I. was going to search for some sign, but after looking all day we only found a thick felt saddle blanket on the other side of the pass. but I got notice the next day from Mr. Richards and that he had been there the day before us and had found Franks cloths gun saddle and everything lying at the posts on the other side they also found a place a little down stream where the high comolotes [camalotes: mats of floating water hyacinth] had been eaten off. so most likely as he was unlucky enough to tie himself to his horse and maybe his horse had tumbled backwards in the water or entagled himself in the camolotes and dragged Frank about in the water untill he was dead and then the horse had not been able to drag him out of the deep water untill the fish [piraña] had eaten him or he had decayed. that is why the horse had not been able to come back for thirteen days and so lean and weak he had been nearly starved. we looked if we could find some bones but could not. I. came in here to get sone the things they found. we had a bad trip ____ the pass was very swollen all three arms swimming. and then had tried to make a short cut and got into a large estero [marsh]or unkall [rushes] and thought we would never get out alive. the grass was so high that when I.
Frank before anything had been ambargared [embargoed] put his things and a lot of things out of the pulperia [pub/store] amoung the colonists. and as soon as we can saddle sell these things Elisa and her little sister are going down to us. We are all going to Ovejetis Fon Oppell also, it is ten legues from Espin and from there there is a diligense [stage-coach] to St. Fe which it reaches in 2 days. 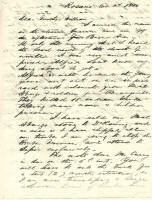 And there Fon Oppel is going to put her on the steamer and she and her sister will go to Rosario and I. will give her a letter to Keenan telling him to put her on the train I. will also send Hansen a letter telling him to have her taken out in his carriage. you had better talk to Hansen about it. From Ovejetes Herman and I. are going down over Esperanza I. gues. it will take us about 5 or 6 day to travel as the roads are splendid and not much danger except from the wild Indians. The indians came into Espin the other day and stole 8 horses. from the colonists. I. immeadiatly mounted some soldiers on my horses and gave chase but could no catch the devels. they have been murdering and stealing in all directions the colonists are all going to leave Espin it is going to bust up. please write to Josephine and tell her the news or better send her this letter. you must excuse the bad writing but my hand is trembling just had a heated discussion with a man whom Frank owed a lot of money. [note in left margin:] We will leave Espin in two or three weeks. JMM. 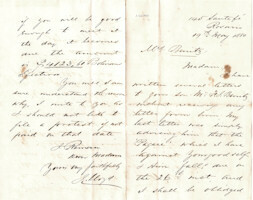 3: Alexander McLean’s Petition — February 14, 1882. 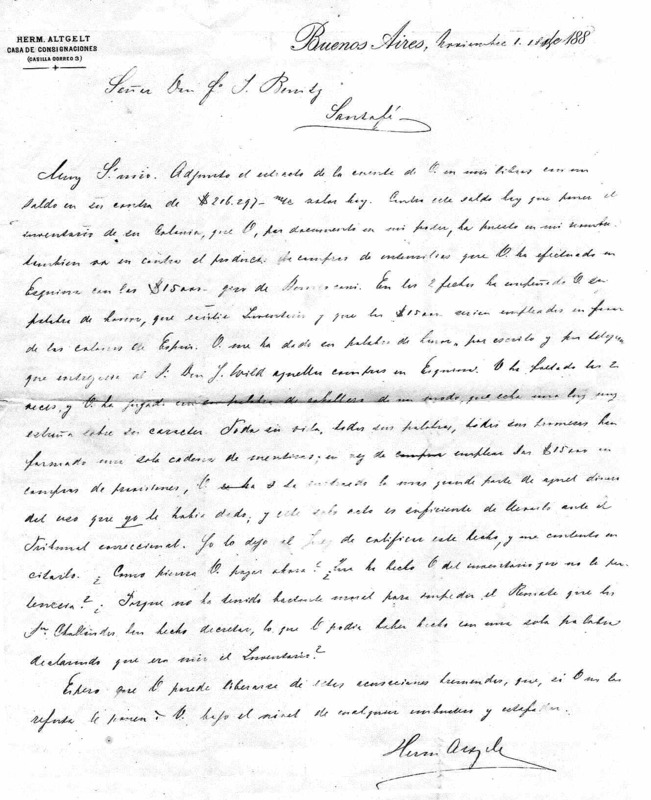 [ The following is an excerpt from a petition submitted by Alexander McLean on February 14, 1882, to the governor of the province of Santa Fé seeking relief from a debt left by Francisco Benitz (3,000 pesos fuertes is approx. 68,200 U$D-2000). 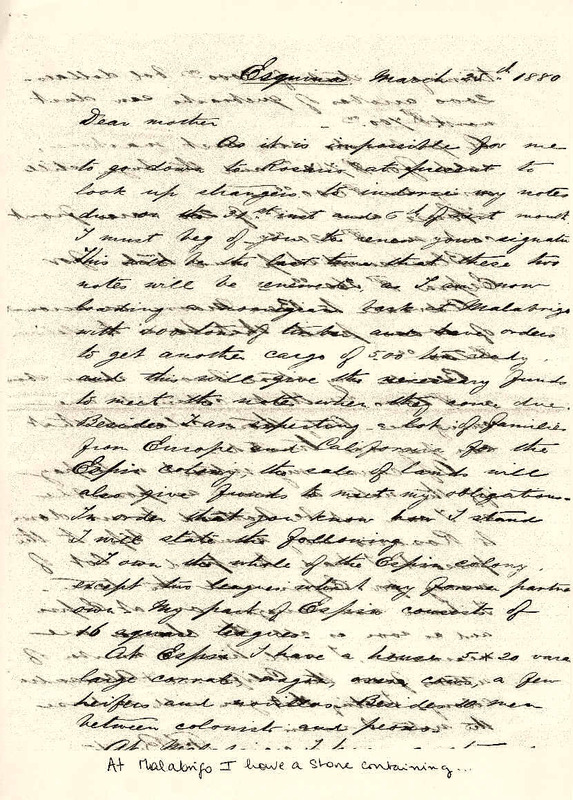 Alexander McLean was a cosigner on the original contract to establish Colonia Espín. The governor granted the petition. No. 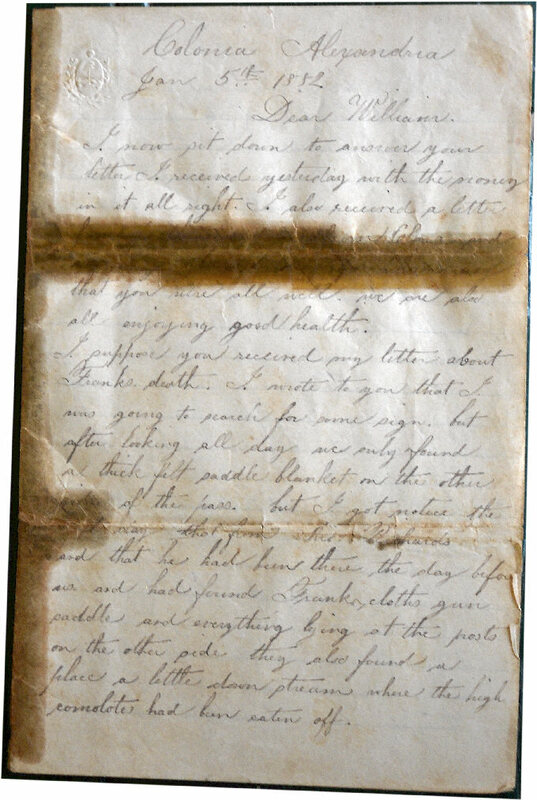 13: Public Notice requiring Frank to appear — 17 February, 1906. 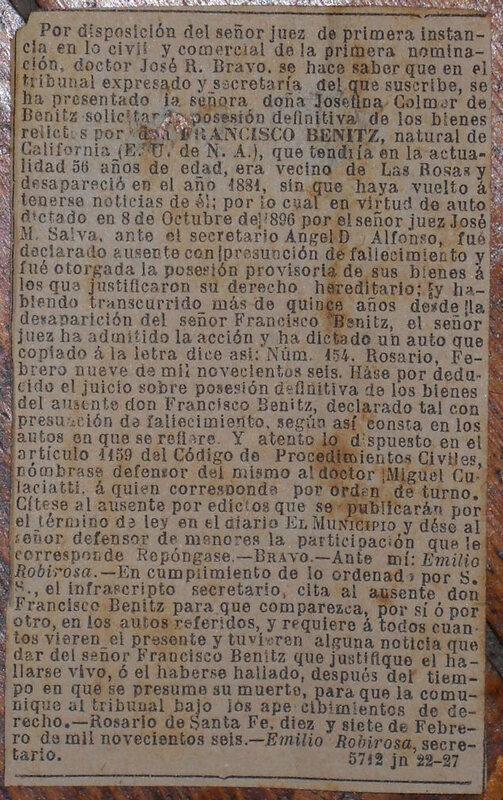 Judge José R. Bravo, on 17 February, 1906, ordered a notice be published five times, once per month, in “El Municipio” requiring Frank or anyone knowing of his whereabouts to appear before the court (in Rosario, SFé). 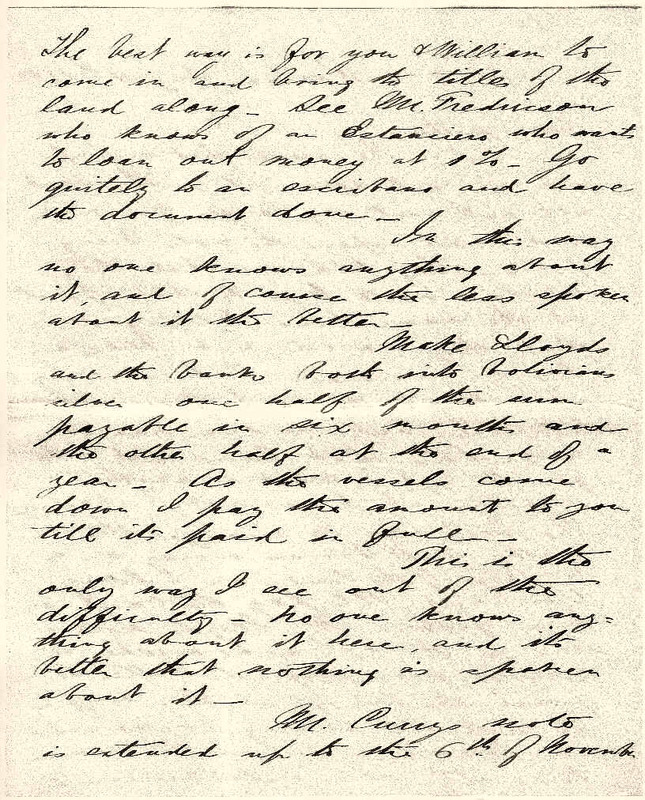 If Frank did not appear, Josefina Colmer [Kolmer] de Benitz could assume full possession of all of his property; Frank’s property having already been assigned provisionally by judge José M. Salva, on 8 October, 1896, as permitted fifteen years after his disappearance. No. 14: F.C. 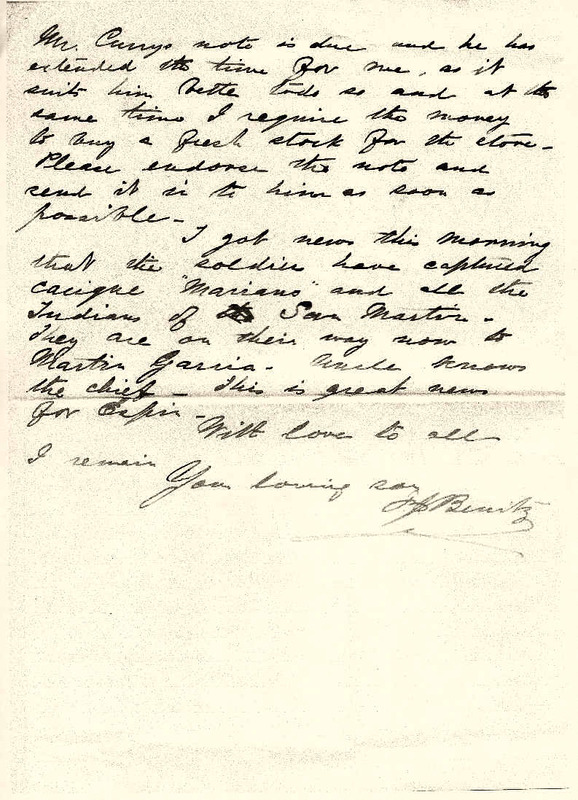 Marty’s fees to have Frank declared dead — 21 May, 1908. Legal fees to have Frank declared dead. Sr. Jimeno - prepared and published the notice, 1906.